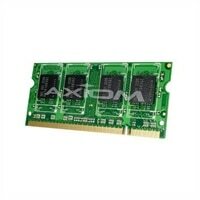 Axiom - Memory -2 GB – SO DIMM 200-pin – DDR2 – 667 MHz / PC2-5300Maximize your system performance with the 2 GB 667 MHz 200-Pin SO DIMM DDR2 Memory Module from Axiom Memory Solutions. It has SO DIMM 200-pin, 2 GB storage capacity, 667 MHz memory speed, Non-ECC data integrity check, with features Unbuffered, and DDR2 technology. This additional memory allows you to open more applications simultaneously while providing the power needed to make them run quickly. It enhances the performance of your system allowing you to work faster and reap improved performance of up-to-date applications and operating systems. Additional memory allows you to tackle the challenges faced by high-end operating systems. It is specially design to meet or exceed OEM specifications. Maximize your system performance with the 2 GB 667 MHz 200-Pin SO DIMM DDR2 Memory Module from Axiom Memory Solutions. It has SO DIMM 200-pin, 2 GB storage capacity, 667 MHz memory speed, Non-ECC data integrity check, with features Unbuffered, and DDR2 technology. This additional memory allows you to open more applications simultaneously while providing the power needed to make them run quickly. It enhances the performance of your system allowing you to work faster and reap improved performance of up-to-date applications and operating systems. Additional memory allows you to tackle the challenges faced by high-end operating systems. It is specially design to meet or exceed OEM specifications.